SUNRISE, FL - The Bruins faced a few challenges heading into Sunday's night tilt against the Panthers. They were facing a back-to-back, after traveling from Tampa Bay and playing nearly 19 hours after their 4-3 shootout win over the Lightning, with a lost hour from Daylight Saving Time. "I think there's a lot of challenges there, and you know, we're not going to make excuses about it but there are challenges there," Head Coach Claude Julien said prior to the matchup. "So we've got to make sure that were that everybody's ready to pull in the same direction here." And pull they did, as Boston put up a four-goal third period to take the 5-2 win over Florida to sweep the five-game season series. With a trip to the Southern sun, the Bruins took four out of four points from the Lightning and Panthers, and now get to enjoy a day off from the ice and two days off from game action before heading back to the chill in Montreal. "Obviously you want to take care of business first," Milan Lucic had said of the team's focus. "It'll make the day off much better if we get a win." The victory gave the Bruins their fifth straight win, and longest winning streak of the season. "You know, it's funny you said we won five in a row," Torey Krug said postgame, helping the Bruins to their two points with his 13th goal of the season. "I didn't even know that. It's one of those things where we've got a good group of leaders in this room and we have that mental approach to the game." "You know, it's going to get a little bit tougher, especially teams that are scratching and clawing to get into the playoffs, and they're gonna bring their best every night." The Bruins sit in a fine position, though, now at the top of the Eastern Conference with 89 points, one above Pittsburgh, if only for one day. "You know, hopefully it's for more than a day. I know they play, I think, two in the next two days, but we've worked hard to get ourselves back to the top of the conference," said Julien. "And by the looks of it, it'll probably be a battle right till the end." 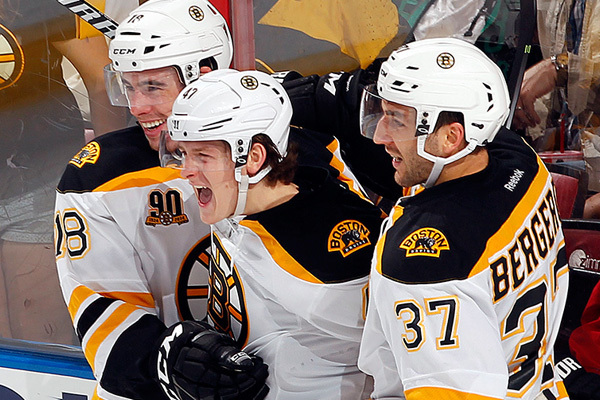 "We set our minds to something, we want to accomplish it," said Krug. The Black & Gold's recent stretch hasn't been perfect. Their best all-around game came against the Capitals two games ago, back in Boston, but they put up solid performances against Tampa Bay and Florida teams that took it to the Bruins, from their netminders out. "I didn't mind our game tonight," said Julien. "You know, I thought for playing a game less than 20 hours later and, you know, having the kind of pace we had to our game, I was pretty impressed with our team." The game was scoreless after the first period, and 1-1 after the second. The Panthers got on the board first in the middle frame, but the Bruins converted on a power play just under three minutes after that tally. Making his Bruins' debut after being acquired from Philadelphia at the trade deadline, defenseman Andrej Meszaros fired a blast from the right point that appeared to deflect off Carl Soderberg and in. Meszaros was eventually credited with the goal, but no matter whose name the 'G' went to on the scoresheet, it was the equalizer the Bruins needed. Despite the tie game, the Bruins were pleased with the amount of chances they generated. They outshot the Panthers 27 to 15 through the first 40 minutes, before the game broke open in the third. "Roberto [Luongo] played well for them, he certainly played well," said Julien. "I know we missed some chances, some scoring opportunities by missing the net, but he also made some good saves for them and, you know, and made it a game right till the end." "So to me, it was good to see our team - even in the third period, we could've looked like a tired team but we didn't - we looked like a determined team and I think that was pretty important for us." Krug gave the Bruins a 2-1 lead 7:38 into the third, dangling in and putting one past Luongo after a slick feed from Brad Marchand. Then, a flurry of three goals in 52 seconds ended with the Bruins up, 4-2. Patrice Bergeron fired in his 19th of the season on the power play to make it 3-1 with the eventual game-winner, with the Panthers' Jimmy Hayes responding just 29 seconds later. In Bruins' fashion, though, they responded. Jarome Iginla fired in his 20th of the season after a turnover, and Chris Kelly sealed the 5-2 win with an empty-netter. So, what was different between the first two periods and the third? "We scored more goals, I guess," Meszaros smirked. "I mean, we played pretty good the first two periods, too. Luongo was great and he kept them in the game and we fired a lot of shots, we talked about going in front of him so he doesn't see the pucks, and obviously two power-play goals helped us and we won the game." A happy locker room on a five-game winning streak meant an enjoyable day off, too. "Guys were ready," said Iginla. "Now, we get a little bit of a break. But definitely, the goal was to be at the top of the conference and we had that chance at the end of the day, and now we've got that." Jarome Iginla's goal gave him his 20th of the season and the 550th of his career. At this point, "milestones" come often and easy for Iginla. But this one was special for a reason beyond the fact that he's now moved into sole possession of 26th for all-time career goals. "I mostly try not to think about things like that or each shot and stuff but once I hit, you know, today was 550 and I'm definitely thankful for it," said Iginla. "It's been fun, you know, I think back to when I started -- you know, I didn't set out those type of goals - so it's cool." He's now only six goals back of the "Chief," Johnny Bucyk, who has 556 career goals. The two have joked back and forth about it before, even back in October when the Bruins were last in Florida to face the Panthers. Chief just so happens to be the next person above Iginla on the list now. "Jordy [Jordan Caron] told me. Chief, you know, he joked with me at the beginning of the year and stuff - it's cool, it's cool," said Iginla. "And I didn't know he was next up or whatever, but I did hear guys were joking today that Chief was six away, so, pretty cool." Bruins forward Daniel Paille left the game in the first period, after taking a hit from Ed Jovanovski on his first shift, and did not return. "The doctor didn't allow him to come back. He took that hit - I'm told it's not very serious," Julien said postgame, of Paille's status. "Again those are hard to, I guess, to comment on because you never know, but he feels pretty good. After the game, I saw him, so hopefully it's just a minor bump."